SSB i.e Sashastra Seema Bal Constable Recruitment 2017 Application Form for total 355 Constable vacancies advertisement has been publish today. SSB Recruitment 2017 Advertisement Notification Application Form www.ssb.nic.in for the post of Constable this is the Latest Job & Careers opportunities in Sashastra Seema Bal. Sashastra Seema Bal has recently publish an advertisement notification for Constable Posts vacancies jobs opening for May 2017. Applications are invited from Indian citizens (male & female) for filling up the post of Constable (GD) under Sports Quota for the year 2016-17 & 2017-18 in Sashastra Seema Bal, Government of India, Ministry of Home Affairs. The post is temporary, but likely to be continued. Selected candidates are liable to serve anywhere in India or outside the territory of India and will be governed by SSB Act and Rules. Total vacancies in Sashastra Seema Bal (SSB) Constable post details are given below. Vacancies: – There are 355 vacancies in the following Sports/Games disciplines. Note:- The vacancies are subject to change and may increase or decrease without any notice. Minimum educational qualification for SSB Recruitment 2017 for the Constable posts is given below. Essential Educational Qualification:- Matriculation or its equivalent from a recognized board. Sports Qualification:- Players who have participated in any International Sports events as a member of the Indian Squad for last 01 (One) year and players who have won medal(s) in any National Games/ Championships recognized by Indian Olympic Association, Sports Federation of (concerned sport) for last 01 (One) year i.e. in between 01.04.2016 to 31.03.2017. Note:- (i) The crucial date to determine age will be the closing date of receipt of application i.e. 30 days from the date of publication of this advertisement in the Employment News. (ii) Only Matriculation certificate or Higher Secondary School Certificate will be accepted as a proof for establishing age of the candidates. (iii) The candidates must fulfill all eligibility conditions and should be in possession of all certificates as on the last date of receipt of application i.e. 30 days from the date of publication of this advertisement in the Employment News. Candidates appearing in the examination/awaiting result, not in possession of educational/ sports certificates need not to apply. (iv) All educational and sports qualification certificate other than Central Board/ State Board should be accompanied with Government notifications declaring the equivalence of such qualification for service under Central Government. 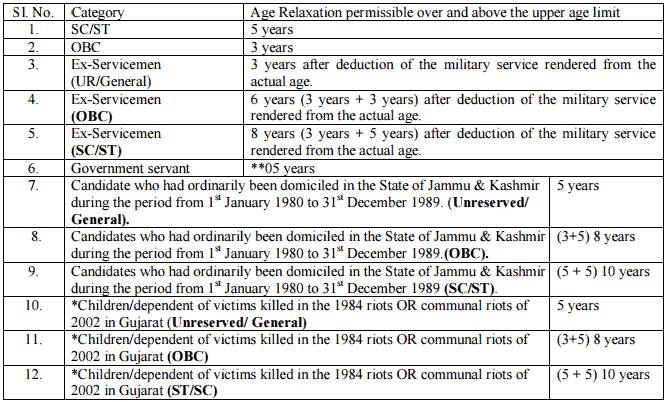 18 to 23 years (Relaxation in age mentioned at Para No.5). *Children mean (a) Son (including adopted son): or (b) Daughter (including adopted daughter) Dependent family members mean: (a) Spouse; or (b) Children; or Brother or Sister in the case of unmarried Govt. servant who were wholly dependent on the Govt. servant at the time of his killing in the riot. The candidate will have to produce a certificate to the effect, issued by the concerned District Collector to claim relaxation in age. In the case of OBC category candidates, the creamy layer status should have been obtained within three years of the closing date of receipt of application as mentioned at para-7(i)(a). The OBC certificate in prescribed format (AnnexureIII) issued after the date of publication of this advertisement in Employment News and before the closing date as mentioned at para-7(i)(a) will be accepted as proof of belonging to OBC category. Candidate who wish to be considered against vacancies reserved or seek age relaxation must submit requisite certificate from the competent authority, in the prescribed format given in the advertisement. The candidates seeking relaxation under SC/ST category should submit the certificate as per Annexure-II. In the event of non-enclosure of the certificate their claim for SC/ST category will not be entertained. The candidates seeking relaxation under OBC category should submit the certificate as per Annexure-III. In the event of non-enclosure of certificate, the candidate will be considered under General (UR/General) category, if he/she fulfills the eligibility conditions prescribed for General category. Certificate on any other format will not be accepted. OTHER ALLOWANCES:- The above posts carry Dearness Allowance, HRA and any other allowances as admissible in SSB from time to time as per Government orders. Physical Standard Test , documentation & written examination. Last Date for Submission of Application : 30-07-2017. (ii) Eligible and desirous candidates should send their application form duly filled in the prescribed format addressed to the Assistant Director (Sports) Force Hqr. Sashastra Seema Bal (SSB), East Block-V, R.K.Puram, New Delhi – 110066 so as to reach on or before the last date of receipt of application. The envelope containing application must be superscribed in block letters as “APPLICATION FOR THE POST OF CONSTABLE (GD) UNDER SPORTS QUOTA – 2016-17 & 2017- 18”. (a) Self attested copy of matriculation certificate. (b) Self attested copies of sports certificates/achievements. (c) Two self attested recent passport size photographs, one pasted on the application form (Annexure-I) at the space provided and the other to be enclosed with the application form. (d) Self attested copy of Scheduled Caste/Scheduled Tribe/OBC certificate in the prescribed format (Annexure-II) or (Annexure-III) as applicable. (e) Self attested copy of community certificate issued from concerned district authorities for getting relaxation in height and chest. (f) Demand Draft/IPO/Banker Cheque of Rs. 100/-(Rupees One Hundred only) (Non- Refundable). (g) Self attested copy of certificate of Bonafide/Domicile /Permanent resident of that State from designated revenue authorities not below the rank of Tehsildar for verification of citizenship of India. (h) Three Self-addressed envelopes of 11.5 cms x 27.5 cms with postage stamps worth Rs.25/- (Rupees twenty-five only) to be affixed on each envelope. IPO should be prepared in favour of Accounts Officer, FHQ, SSB, New Delhi payable at New Delhi. Demand Draft / Banker Cheque should be prepared in favour of Accounts Officer, FHQ, SSB, New Delhi payable at State Bank of India, R.K. Puram, New Delhi (Branch Code-01076). SC/ST & Female candidates are exempted from payment of examination fees. SSB Constable Exam Questions Answers. This mock test having question each, with four choices. On each click on answers system will tell you where the answers is correct or incorrect. There many online practice set of Sarkari Naukri Exam Question answers quiz. SSB i.e Sashastra Seema Bal Recruitment 2016 Application Form for total 2068 Constable vacancies advertisement has been publish today. Applications are invited from Indian citizens for filling up the following posts of Group-‘C’ Non-Gazetted, (Combatised) in Sashastra Seema Bal, Ministry of Home Affairs, Government of India. The posts are temporary, but likely to continue. Selected candidates are liable to serve anywhere in India or outside the territory of India and will be governed by SSB Act and Rules. Qualification:- Degree in Electronics or Telecommunication or Science with Physics with Physics, Chemistry and Mathematics or equivalent for Post(1), 12th with Science (OR) Diploma in Electronics or Telecommunication or equivalent for Post(2), Matriculation or equivalent with ITI in Electronics (OR) 12th with Science for Post(3). For Other eligibility criteria details refer official notification. Rs.200/- for General for Post(1). Rs.100/- for SC/ST category candidates for Post(2,3) & No Fee for SC, ST, Ex.SM reserved candidates for All. The application fee should be deposited through demand draft drawn in favour of “Inspector General Frontier HQ SSB, Ranikhet SBI, Ranikhet Branch Code-0704” & “Accounts Officer, SBI Chenikuthi Branch Code-7976”. Last Date for Receiving Hard Copy of Application Form: 30-01-2017. 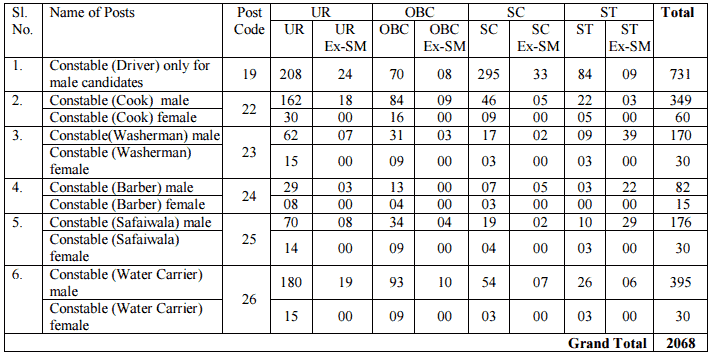 Minimum educational qualification for SSB Recruitment 2016 for the Constable posts is given below. i) Matriculation or equivalent from a recognized Board. ii) Must possess valid Heavy Vehicle Driving license. ii) Must qualify trade test. * DESIRABLE:-Multi-skilled candidates will be given preference. The above posts carry pay in Pay Band-1 Rs.5200-20200/- + Grade Pay Rs.2000/-, Dearness Allowance, Ration Money, Washing Allowance as admissible, Special Compensatory Allowance while posted in specified border areas, free uniform, free accommodation or HRA, Transport Allowance, Free leave pass and any other allowance as admissible in SSB from time to time under the rules. Selection Process will be based on Physical Standard Test , documentation & written examination. NOTE:- EX-SERVICEMEN ARE EXEMPTED FROM PHYSICAL EFFICIENCY TEST. HOWEVER, THEY WILL HAVE TO APPEAR IN COMMON ENTRANCE TEST, TRADE/TECHNICAL TEST AND DETAILED MEDICAL EXAMINATION. 1. For Garhwalis, Kumaonis, Dogras, Marathas candidates and candidates belonging to the States of Assam, Himachal Pradesh, State of Jammu and Kashmir. 2. Candidates falling in the categories of Gorkhas and candidates belonging to the States of Sikkim, Nagaland, Arunachal Pradesh, Manipur, Tripura, Mizoram and Meghalaya. 3. Candidates belonging to the Scheduled Tribes. 4. Scheduled Tribes candidates belonging to the states of Sikkim, Nagaland, Arunachal Pradesh, Manipur, Tripura, Mizoram, Maghalaya and the Left Wing Extremism affected districts. 1. For Garhwalis, Kumaonis, Gorkhas, Dogras, Marathas candidates and candidates belonging to the States of Sikkim, Nagaland, Arunachal Pradesh, Manipur, Tripura, Mizoram,Meghalaya, Assam, Himachal Pradesh, Kashmir and Leh & Ladakh regions of J&K. 2. Candidates belonging to Scheduled Tribes categories. Weight:- Weight of the candidate should be proportionate to height and age as per detail given below. Weight will not be disqualification at the time of PST. However, the overweight/ underweight candidates will be disqualified at the time of Detailed Medical Examination based on weight and age on the day of Detailed Medical Examination and the height as measured during Physical Standard Test. The body weights given in the chart are corresponding to only certain height (in cms) on even numbers only. In respect of heights in between, the principle of ‘Average’ will be utilized for calculating body weights. In doubtful cases of overweight, the assessment will be made on the basis of BMI. Candidates declared disqualified in Physical Standard Test can prefer an appeal to the appellate authority for re-measurement of Height and Chest only. The appeals of the candidates shall be disposed off on the same day. Candidates who intend to avail relaxation in height and chest measurements will have to submit certificate as per Annexure-II/IV. DOCUMENTATION: – The candidate who qualify the Physical Standard Test will have to go through documentation, in which candidates will have to produce all original documents/certificates the detail of whose are given in the application form to Recruitment Board, failing which the candidate will be disqualified. Trade Test:- The Trade Test will be of 50 marks and the minimum qualifying marks for all candidates including SC/ST/OBC category candidates will be 60%. The final merit will be drawn on the basis of marks obtained in Common Entrance Test (CET) Paper-I and Trade Test. Visual correction of any kind is not permitted even by glasses. Visual correction of any kind is not permitted for distant vision. Should be able to read with glasses for near vision ONLY. Hypermetrophopia: +2 Ds, Myopia: 2.5 DS (including cylinder) Note: Age related physiological presbyopic changes are likely to occur above 35 years so age wise presbyopic changes relaxation is permitted as mentioned below for near vision (this is in addition to that above relaxation already provided for distant vision. 1. +1DS upto 40 years. 2. +2 DS upto 50 years. In case Candidate is subject to Nepal or Bhutan, a self attested certificate of eligibility issued by Government of India (applicable only for the post of Constable (Driver). Eligible and desirous candidates should send their application form duly filled in prescribed format. General & OBC category candidates should pay examination fee of Rs.50/- (Rupees fifty only) (Non Refundable) in the form of IPO/Demand Draft/Banker Cheque as per details given below against each. The cover containing application must be superscribed in block letters as “APPLICATION FOR THE POST OF (NAME OF POST APPLIED)-2016”.